A Yoghurt Tart that’s a bit like a cheesecake. 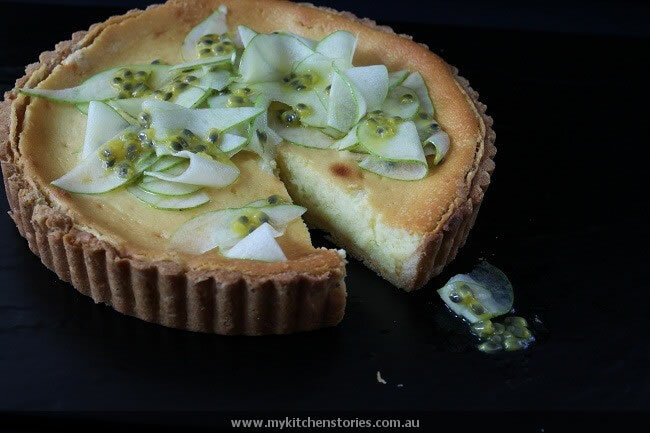 Its not too sweet and goes perfectly with one of my favourite fruits, passionfruit. After my sister was chased across the airfield by a cow in Vanuatu she had to load her wheeley bag into a small boat captained by a local man who was used to navigating boats between the Islands at night. The five adults, medical equipment and bags were loaded into the shallow sided row boat and caste into the darkness on a windy rough night. My poor sister who wears a jumper on a 30 degree day, hung on for dear life as the captain battled the elements and waves crashed over the little boat. They arrived at around 10 at night bedraggled exhausted and hungry. This is not resort style Vanuatu, this is village style, and there is not much food or comfort. Sick children, pregnant women who never see medical care, bugs and no refrigeration and after days of caring for everyone they could, their time here was mercifully over……………….. anyone would be keen to leave, even if the way out meant a torturous boat ride. The journey back by boat to the next Island was reasonably uneventful but this was perhaps an omen for the rest of the journey to come. The leg back to Port Vila and a comfortable bed and shower, was another small flight. A small plane where the pilot is pretty much next to you, is not really my idea of fun, and neither is sitting next to my sister in this situation. As they loaded their bags onto the small plane, the pilot spluttered and coughed and asked for some drugs (nurses usually have these), once he was dosed up, they began loading the plane. He shook his head disapprovingly, at the amount of luggage, warning them that if the plane was too heavy he would have to do a turn and try again. They bounced down the grassy strip and inched off the ground the plane barely reached the upper branches of the trees lining the runway before it abruptly swung around and bounced back down the air strip. Bags were off loaded before another attempt was made and failed and they returned once again to the grassy airstrip. The pilot suggested some of them would have to get off….and my sister was out on that grass before he finished the sentence. Another of the girls volunteered stay behind, to sit and wait in a tiny tin shed in the heat. There was no clear idea when they would be picked up but this was better than another roller coaster ride to the trees and back. When a couple of large men with machetes approached the shed the girls were unsure if they would ever make it to that comfortable bed in Port Vila or any comfort ever again. These two warriors barely spoke English and my sisters nervous chatter and offers of nuts and muesli bars were refused. They mentioned they had been “sent to protect”….pointing at the machetes, and they all sat quietly in the shed till the plane returned a few hours later. The scariest thought now being….who was out there on this tiny island that might want to harm them? They did get back to Port Vila, and I am glad I wasn’t on the plane journey there. My sister really loves a cheesecake and this week I worked out a great new way to make one with yoghurt. Its light and fresh and quick. This is a very delicious tart. It is sweet but not too sweet with a light moussey filling. 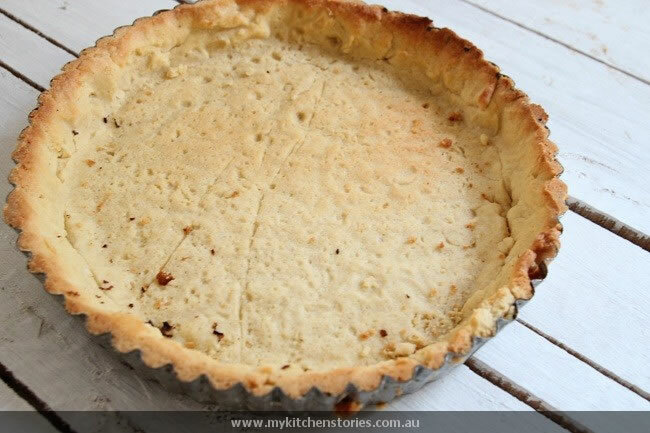 You will need a cooked tart case for this recipe. Add the eggs and the flour mixing well. 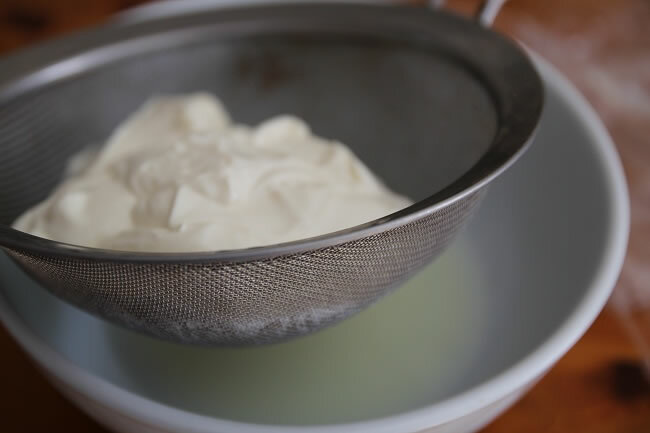 Add the vanilla and the yoghurt and beat till well combined. 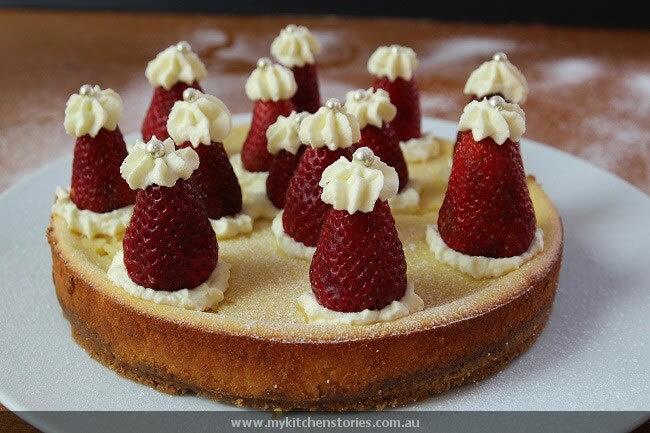 And heres a little surprise, Santa Yoghurt Tart…………………………..with crumb crust. Hey would you still like me on Facebook? Wow sound like you sister has a very interesting life, what does she do? Wow! What an ordeal your sister had! I imagine this cheesecake would be a very welcome surprise once she got back – it looks fantastic! Great story. I completely relate to your sister’s adventures. Having lived in Fiji for a year when younger and basically roughing it the whole time, I too have some unbelievable stories to tell of this kind, many concerning means of transport. Lovely surprise tart – very clever. Not only is this tart a stunner, it looks absolutely delicious. I can’t always get passion fruit, but I just bought some this week in the market. Now I know just how I should use them. God that looks amazing. going to make this with GF pastry really soon. That is definitely a side of Vanuatu that we don’t usually hear about! 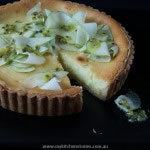 I think I might stick to this tart without the scary travel moments – it looks beautiful. I love yoghurt in baked desserts. Ooh I love the idea of a yoghurt cheese cake. I bet it tastes pretty amazing. What an adventure you sister was on. I don’t think I’d have been too keen to get on that plane! 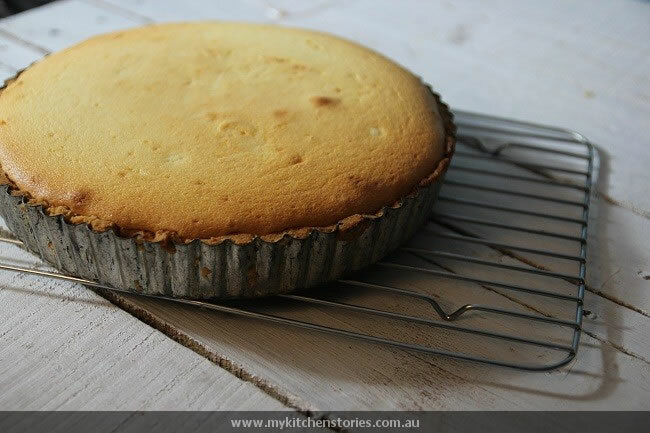 Oh yum… This tart screams summer :)) What an adventure you had too! PERFECTION! I love the decorative pear ribbons atop. Creative and unique! Oh yum, I love the idea of creating a yoghurt version of a cheesecake. 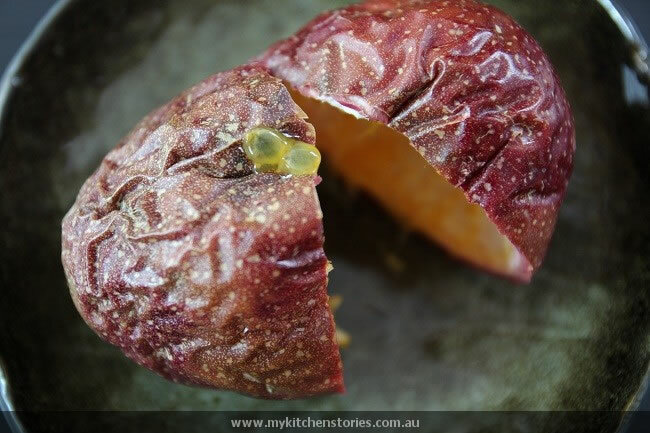 Gorgeous flavours too with the pear and passionfruit. What a lovely tart indeed! Yoghurt would add such a nice Tang- yummo! Lorraine says the stories are starting resemble your families , Charlie! yummychunklet recently posted..No TwD for me! Give me Oatmeal Banana Pancakes instead. 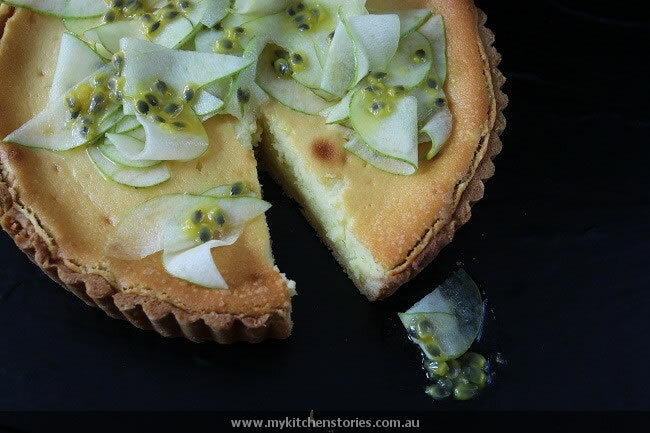 What a beautiful tart and I love that you used passionfruit. That’s something I don’t see used very often. What a gorgeous tart! I bet it tastes divine! And that story of your sisters is so scary. I don’t know what I’d do in that situation. Glad she got home ok.